The Social Golf Course: Increasing Rounds with Social Media, written by Zeb Welborn of 19th Hole Media and John Hakim from Greenskeeper.org is an introduction to golf course marketing with social media. Social media is not just a marketing and sales tool. It creates word-of-mouth excitement. It can help build business. It can attract more golfers. Market your golf course more effectively in the 21st century with social media using tools like Facebook, Twitter, email marketing, blogs, Instagram, YouTube, Vine, LinkedIn, Greenskeeper.org, Google+ and much, much more. Must read for golf industry professionals. Excellent resource for anyone in golf industry. Well written and insightful. This publication has a lot to offer, not only to golf course operations but also to all businesses. Ideas are practical and we always could use reminders on how to better improve our interactions with customers. Must read for everyone. 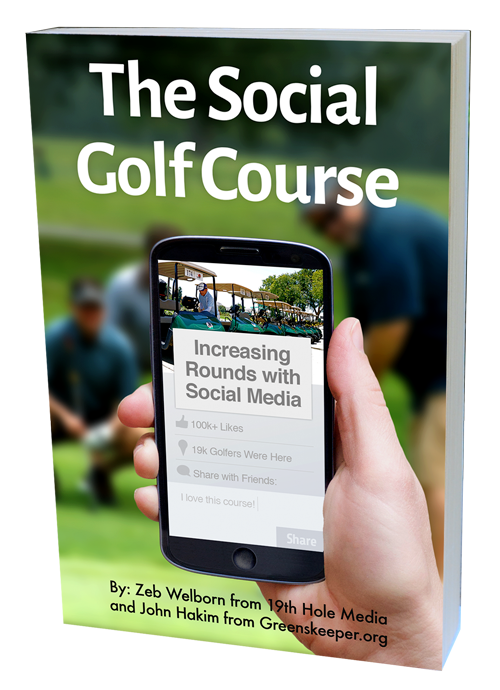 Zeb not only explains Social Media’s application to the golf world, but broadens the lessons contained to emphasis the need to apply this with clients, referral partners and staff as the margins between the real world and electronic social media continues to blur. Åbsolutely loved it. Many of the suggestions are intuitive toward the end of the book with discussion of service in a service business but certainly deserved discussion. The social media and marketing information and suggestions are helpful to a novice in social media. Even though it is aimed at the golf course industry it easily can be extrapolated to other businesses, golf or non-golf related. Easily read in one sitting which is helpful but chock full of information. Well worth a look if you are in or considering getting into the use of social media beyond developing a web page for your business. What all golf course owners, operators and employees must read and have on their desk top. The actual desk as well as the one on your computer. Zeb and John have created a great starting point and guide for the golf industry as well as any industry looking for help to go from the “old school” methods to the new social driven life style and economy we all find ourselves in today’s world. Let’s just make sure to turn off those smart phones while out playing the greatest game in the world. Author recognizes that social media really only benefits certain types of businesses. Those where an element of community exists. Even the name of his company (19th Hole) points to the community aspect of golf. Social media seems to be a waste of time to most other businesses. These are two smart, energetic and technologically savvy young men who have turned their attention to the business of golf. Their enthusiasm for the game is infectious. And they are nothing but generous in sharing their methods and ideas for getting more players out on the fairways. This is a worthwhile read. These guys are on to something. As the Owner of a Social Media Marketing Agency, Bad Rhino, I am always looking for new ideas and to keep my Company on the cutting edge of Social Media. I picked up this book to read about Golf Course Marketing as we have been approached to work with a few courses and Professionals. Zeb does an outstanding job in painting the whole picture and not just fluff. This book is a must for any Golf industry professional and especially Golf Course owners/Managers. In fact any small business owner could use the concepts in this book. I started reading it over lunch and couldn’t stop, its a great easy read packed with outstanding REAL world facts to be launch a successful Social Media Marketing Campaign. I really enjoyed reading this book. Great information about social media. The Social Golf Course is a great book. The information a about how to utilize social media can be used in every type of business. I learned a lot about how to make social media work for me. Also, I learned a lot about golf and the history of golf. We all need to change with the times and Zeb has done a fantastic job of illustrating how we can benefit from using social media to market ourselves in a positive way. I enjoyed reading this book. Not Only For the Golfing Industry!!!! If you’re looking for ways to improve exposure for your business, I highly recommend this book. Lots of great tips and insight into building a social media strategy around your business. 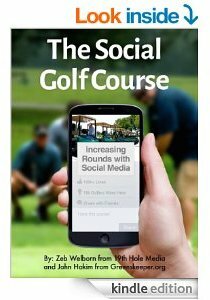 The focus of the book is on golf courses, but the principles are relevant to any business looking to grow through social media. I enjoyed this book despite the fact that Golf course mgmt is not my business. I enjoy golf and this book helped educate me on what course mgmt must deal with in order to be successful in this new age of internet marketing. So many of the topics are applicable to just about any consumer based industry. Book is well written and definitely worth a read. I cannot remember how I cam across this book – probably looking for a Kindle read and it was free for a day – but I found it very helpful even though, like others here, I don’t own a golf course! I do play a couple of days a week though and am a member of a club. And boy should our club be taking lots of these messages and throughts and putting into action to increase the membership; social activity and general reputation of the club. Easy steps – just needs buy- in and action. I also agree that this book is relevant to any industry or business looking to become a “social” organization. Engage people – of all ages – without having to pressure sell.This book provides a strategic and tactical roadmap for you to think about and discuss at your own club – and from there to think about what you can\ cannot do now – and so create a “social” golf course business. So maybe the next monthly meeting (or quarterly) of the golf committee will be less about Bill’s handicap cut of 1; or the extra £3 in the competitions pot – and more about how have we engaged with our existing members and potential new ones and paying customers. This book should be required reading for senior management in any golf operation. The concepts discussed apply to much more than just the golf industry. Almost any business could profit by the social media and customer service information in this book. Portion of the cover photo for the book by Aberdeen Proving Ground photo (http://www.flickr.com/photos/usagapg/7166419024/) used under CC-BY https://creativecommons.org/licenses/by/2.0/ Blurred from original and built upon.